We offer a particularly wide range of delicious breakfasts that have earned us an AA Breakfast Award for 2018. This coveted award is only presented to establishments serving breakfasts, with an emphasis on freshly prepared local ingredients that exceed the quality requirements of a 4* star rating. 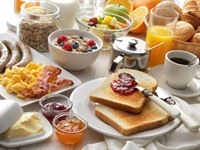 Included in the wide selection of breakfasts we offer are those also suitable for vegetarians, vegans and gluten free. We go to great lengths to use high quality local produce, including meaty Devon sausages and smoked back bacon from local farm shops, and large free range eggs from a local farm. We cook and prepare our food in the healthiest way possible, all to bring out the very best in all the breakfasts we serve. 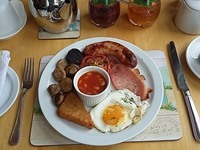 Delicious large meaty sausage, smoked back bacon and a large free range egg, all local Devon produce, hash brown, mushrooms, baked vine tomato half, black pudding and all rounded off with an individual serving of beans. 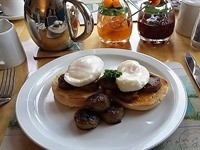 Our Devonshire Hog and Hen with slices of gently spiced hogs pudding and two poached free range eggs served on English muffin. 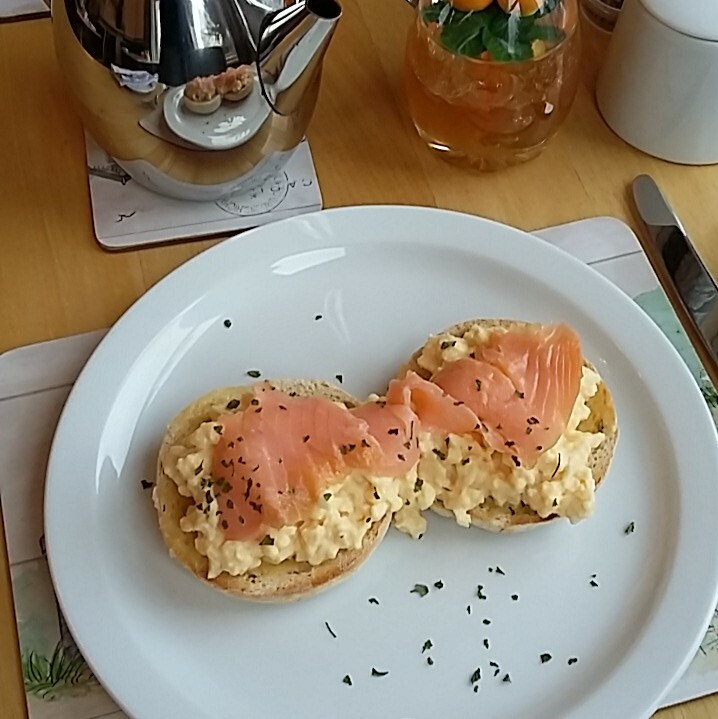 For a lighter alternative, try our delicious creamy scrambled egg with smoked salmon, served on an English muffin. 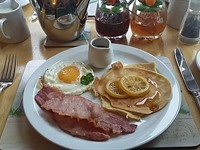 Our American breakfast consists of homemade cinnamon pancakes, two slices of smoked back bacon, and a fried egg, topped off with a pot of maple syrup.